I love this because I do not do good horse drawings so that's so beautiful, love your picture. Wow, you did amazing! Great detail! Love it! Arab breeds are my favorite! Great job! God bless you! This looks like a real horse that you drew from a picture. That's pretty cool, I LOVE Arabs, Anglo and Shagya they are my fave breeds! Not real! You are so good! Hey, that's so cool, can you teach me how to draw like that? I've got the shape of the horse down but I can't seem to get the shading right and the highlighting right. I wish I could draw like you! Your drawing is so amazing! I love horses and this inspires me! Beautiful! I love Arabians. In color would she be chestnut or white? I love it! It's sooo pretty! You are an amazing artist! And drawing horses takes practice! Oh my gosh! This is one of the best drawings I've seen. I totally need to learn to do this. Awesome! I wish I could draw like that! You're GREAT! Wow, that is outstanding! You will have to teach me how to do that! Wow,amazing drawing!How did you do that! ?It is so cool! This is truly amazing, your a wonderful artist. Kepp drawing horses! That is really amazing! I wish I could draw like that! But I am getting better at drawing horses all the time, so I hope I'll be able to do that in a little while. Wow! You are so talented! That is really impressive. Good job. That is so cool you are so talented! I wish I could draw like you! Keep on drawing please! Like a vivid fairytale. You are one good artist. It looks so real! I've never seen anything like it! That is one great drawing of an Arabian!!!!!! omigosh!!!!! U have a true art heart!!! I bet u wanna be an artist. GIRLFRIEND! That is pretty darn good! You really have skill! Do you ride? I DO! My class is learning maiden canter now. This drawing is incredibly lifelike! You should SO do it over on canvas! I could never draw that good!! How old are you? I love it! I am pretty good at drawing horses but you are really good I need some advice (I like the pose of the horse). Wow! I need some tips! this is just amazing and every detail is perfect!! I absolutely LOVE the horse! this pic is amazing, i absolutely love it! i love the drawing, but i HATE Arabians! This is the greatest pic of a horse i have ever seen! LUV IT!!!!!!!!!!!!!!!!!!!!!!!!!!!!!!!!!!!!!!!!!!!!!!!!!!!!!!!!!!!!!!!!!!!! YOU INSPIRED ME SO MUCH! PLEASE BE MY FRIEND! that is some amazing art, i wish i could draw like that. OH MY GOODNESS THAT IS AMAZZING!! I love the reality in this picture it almost jumps out into real life. Ok well this is a very cool drawing, I like it a lot especially how you did the tail it's pretty. this pic reminds me of a young arabian i ride. I KNOW WHO IT IS!!!!! 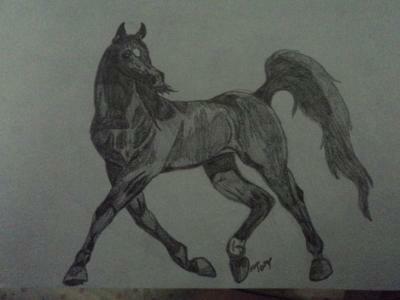 i can draw like that as i go horse riding and i have been practicing since i was about 3 years old! Beautifully done. Horses are such beautiful creatures! Wow, how do you do that??? It looks so real! So much detail and shading! I'm good at drawing horses to but not as good as that! Great job! I love horses so much and i love that drawing so so so so so so so so so so so so so so so so so so so much it is so cute! This is great!! How did you do this? I think u should become an artist when you get older. I mean who wouldn't like this????? one word describes this. AMAZING! WOW you can really draw!!! i wish that i could draw like you! i could never draw like that. how did you draw that horse? it looks so real! i love this drawing, i wish i could draw as good as this drawing. Good job. You have the right angle and expression and the head is the right size because you know arabians have small heads, but I recommend you should of made the legs skinnier. THIS DRAWING IS SO AMAZING!!!!!!!!!!!!!!!! wow... is this horse you drew an arabian? my friend absolutely loves arabian horses! i'll defiantly have to show her!!! that pictures amazing, is it an arabian? this is the best horse drawing i have ever seen, i love it! Awesome drawing!!!!! You are a very talented person! this is pretty good, but y is it so dark? Awesome Drawing! I wish that i could draw like that but the head is a little out of proportion to the legs. :) but i still think it is an awesome drawing!! well done!! Your drawing is AMAZING. I wish i had half your talent. Hiya! I love your drawing and my favorite breed is Arabian horses!!! your drawing is good, i can draw but no way near as good as you!!! i love it! love your horse, your a little bit better than me at drawing. But i still love it and i'm writing a horse book but i already drew the cover for it. woooow you are good and you did this by urself! WOW OMG i love it!!! hiya i love the pic of the horse is it an arab??? how on earth did you do that??? I'm crazy about all sketches but i don't draw any myself, unfortunately... yours is one of the best i've seen! that horse has power written all over it. Awesome & bodacious! just had a baby! It's called your drawing. good but the boys head and legs is disproportion. overall pretty nice! wow!!! that is so good, I could never draw that detailed. I ABSOLUTELY LOVE IT!!!! I love it. I wish I could do that!!!!!!!!!! That's all i can say is omg. Just plain ole omg . wow Morgan, your drawing rocks, I could NEVER draw that good. It is very realistic. I love it alot. Your drawing is amaizing!!! I wish I could draw as good as you!!! his head is a bit small, and he has thick legs... AMAZING shading. you have excellent shading skills. this is shaded beautifully! but it's a little not proportional. keep practicing. it will get better! great shading though! wow it is really life like. I LO-OVe it's just that the head looks small no offense. But otherwise it looks great! As a A'level fine art student i love to draw/paint etc. especially horses and i would like to tell you how much i liked your horse drawing. it really caught my eye! It is very good and detailed and i'm sure that you must have put a lot of time and effort into it. If i would criticize on anything it would be that perhaps you should take a look at your shading, but otherwise it is very well done and i would be very proud if i were you!! OMG!!! it is amazing! the only thing i would change is to make the legs shorter but please, if it offends you ignore this comment but overall it is amazing!!! You're a really good drawer! You've inspired me to go draw more horses now. Sweet is it an Arabian Cause' that's what it looks like to me. awesome! hey all you need to do is make the head a little bit bigger. don't get offended cause the only way to get better is to fix the mistakes. trust me i spend forever to draw everything the best i can! where did you all learn to draw like that! i love all of them but this one is my favorite. That's amazing Morgan! I could never draw anything like that! that's a very cool horse you should become an artist!! I think you have the gift of an artist! Well done. I would only suggest to improve on the legs: they're slightly long, and much to thick of size. I reckon that you should shorten and thin them. But, honestly, ignore my comments or wish to follow them. You are an AAMAAAZZZIIINNNGGG artist. Underline that word, - AMAZING! Haha, good job. In my drawings I focus on the shading and wow, you are amazing at shading! ITS AMAZING!!!! How old are you? Wow... That's a really amazing picture! You are amazing, nice picture! wow I'm not as good as that! how do you draw muscles like that? That is sooo beautiful! I know i can't ever draw like that! What r u talking about! you are not near pro yet?? U r an extreeeme pro!! I could never draw like that! THAT IS AWESOME! IT IS SOOOOOO COOL!!! wow! you draw like a pro!